Do you remember a funny/interesting story about me or that happend with me? Remind me and I will write it up. Maybe today! Though I am thrilled to be home (if not for the flushing toilets alone), I do miss my lemurs. My favorite photos are action shots, especially those of lemurs playing. So, I figured I'd share a few. If you were unaware, you can double click the photos on my blog to view them in a larger size. FYI. 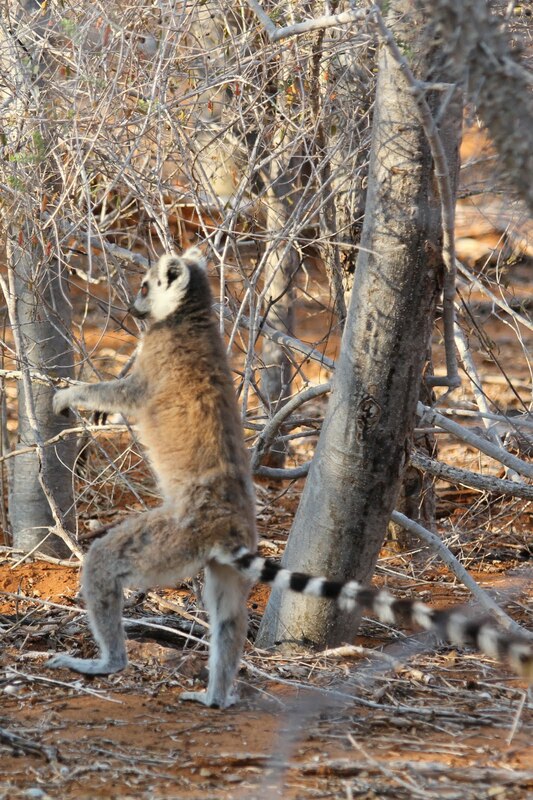 This might be my favorite lemur pic- Tido mid jump. 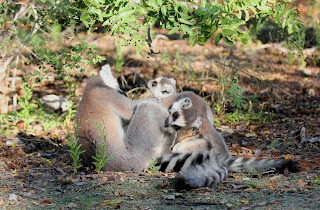 BTW- the universal signs that you want to play (in lemur, of course) are to either a) roll on your head, or b) bite some one else's bum. Here is a good headroll. I can't find a bum bite shot, but here is a leg bite. And a bit more. This could double as a lemur zombie. 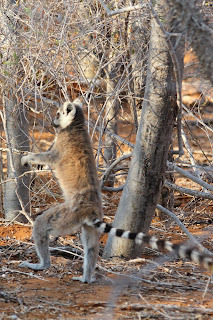 And here is one of a lemur just cruising along looking goofy. Maybe I could stuff Kitty into a lemur suit. I love it when they do the zombie walk! I remember in 2006 in the spiny forest at Berenty, one of my groups ventured into a field with tall grass where a lone kily tree stood, and the *entire group* did the zombie walk with their arms out in front of them all stiff. My assistant and I laughed and laughed. I just love when they are zombies! I also love the 'I'm so stinky/look at my square head' that the males do. Way too cute! Another thought, for as long as I can remember you would never use a toilet other than one that is pristine. No outhouses camping, no gas stations while travelling, no BC Ferries, not even at someones house if it wasnt quite right. So congradulations on finding a toilet anywhere, even on a cactus paddle! Or with curious children gathering around the vazaha (you) and poking at you with a stick!! !